Service: 10:00 am Thursday, May 24, 2018 at Inn on Westport, 4000 S. Westport Ave., Sioux Falls, SD. 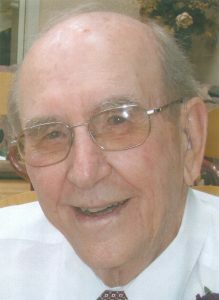 Buell Elgin Arlington Kittelson, 96, peacefully left his earthly home in Sioux Falls, SD and entered into eternal life on May 20th, 2018. Buell was born in Lincoln County, SD on November 23, 1921 to Tilman and Mabel (Urdahl) Kittelson. The first eight years of his schooling were spent at Plain View country school in Lincoln township followed by high school in Beresford, SD. He had many fond memories of growing up on the farm with his older brother Jules and developed several life-long friendships with the neighboring children. One of those friends was Reynold Eneboe, whom he has known since they were six years old. Even 90 years later, at the age of 96, one could often see them dining together at the assisted living center where they both resided. He used to joke that Reynold was the older, wiser of the two, since he was a month older than Buell. In 1940, Buell joined the Army. He was assigned to the cavalry unit at Fort Mead, near Sturgis, SD and was then given the opportunity to be part of the newly formed motorcycle brigade. He transfered to the new Army Air Corps, becoming a glider pilot instructor and eventually flying C-46 transport planes across the South Pacific during WWII. After the war, he attended pilot instructor school in Oklahoma and continued his love of flying. When he returned home, he noticed that Reynold’s little sister, Ruthie, had grown up to become a smart, fun-loving young woman of strong faith and good character – and good looking too! Someone who could be a fine companion for life. He won her over, and Buell and Ruth were married at the Moe Parish parsonage on January 19, 1951. The couple moved to California where Ruth worked as a nurse and Buell was employed by the Boeing company. In 1953, the farm called them back to South Dakota, where they lived and worked for 51 years. During that time, Buell was an active part of the community. He spent a decade on the Beresford School Board and was a life-long member of Romsdal Lutheran Church, where he spent countless hours serving various roles such as treasurer and supporting the work of the church. In December of 2004, Buell and Ruth left the farm in the capable hands of their daughter, Jan, and moved to The Inn on Westport in Sioux Falls, SD. At the Inn, he continued to serve in whatever capacity he could – such as being part of the new resident welcoming team, helping in the church services by serving communion, and acting as treasurer for the offering. In 2006, just shy of his 85th birthday, his granddaughter told him he needed a job, and talked him into applying to work as a driver for the company she worked with. Thus began his career at Enterprise Rent-A-Car. As the story goes, on the application he was asked which position he wanted. His answer, “I want to be the boss!” And salary? “$100,000.” He was hired on the spot. For 7 very enjoyable years he helped shuttle cars between Sioux Falls, Omaha, Aberdeen, Pierre and surrounding towns, sometimes working 11 hour days and, of course, making friends wherever he went. He loved getting out into the countryside and being able to keep track of the crop planting, growing and harvesting. When he reached his 92nd birthday, he stated that old age was beginning to creep in, and decided it was time to wind down his career. When his former boss heard about his passing, he said, “God bless him, he was such a kind soul. He always had the biggest smile on his face and nothing but good things to say.” A good summary of this good man. Grateful for having shared his life are his son Spencer and his wife Sheila (Sogn) of Sioux Falls, SD; his daughter Jan and her husband Robert Schroeder of rural Beresford, SD; his grandchildren Amos (Heather) Kittelson and their children, Jacob Wallin, Brittany, Stella and Evelyn of Hills, MN; Anna Kittelson; and her children, Trever Budd, Ella and Samuel Szwarc of Rapid City, SD; Bessie (Derek) Tan and their children, Gabriel, Tessa, Madilynn, Ezekiel and Isabel of Davenport IA; Micah Kittelson of Sioux Falls, SD; his brother-in-law, Reynold Eneboe of Sioux Falls, and several nieces, nephews and friends. Buell was welcomed to eternal life by his parents, brother Jules, wife Ruth, and grandson Nathaniel. Condolences to the Kittelson family. May Jehovah the “God of Comfort” bring you comfort and peace at this difficult time (2 Corinthians 1:3 & 4). Your family are in our prayers. We extend our deepest sympathies to all of Buell’s family upon the passing of such a great, fun loving man. I was fortunate to meet the Kittelsons many years ago when our family (the Thomas’) moved to the farm just east of them. Buell and Ruth became like an uncle and aunt and were such kind, helpful neighbors. I also enjoyed babysitting for Spencer and Jan who were such smart, cute kids! God bless all of you as say farewell to Buell. Such fond memories of your dad, and my dad,! Bowling comes to mind, parties singing and just always remember that twinkle in your dad’s eye. Jan, it’s such great memories of our time together in grade school and all the fun we had on your farm. It certainly sounds like a life well-lived for your dad. I know he loved his children and grandchildren very much as he did his wonderful wife. Condolences to you all.